The PYRO Optical pyrometer temperature sensor for non contact high temperature measurement operates by allowing the operator to compare the intensity of light radiated from a target at visible .655µm wavelength to the known brightness of an internal calibrated lamp. This is achieved by utilizing a rotating optical photoscreenic wedge that functions as a variable neutral density filter. 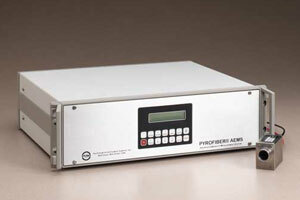 The PYRO Optical pyrometer can achieve temperature measurement accuracy to ± 0.5% of the temperature being observed. Small target sizes from 0.055″ at distances of 3″ to infinity can be achieved. Supplementary magnification lenses for smaller targets at shorter distances are available. 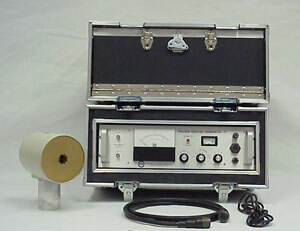 The “PYRO” Optical pyrometer features a circular direct reading scale on the instrument. Several models provide temperature scales in °F, °C or both. The PYRO Optical pyrometer units are constructed in a rugged steel housing providing years of trouble free industrial plant use. 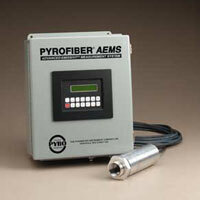 The PYRO Optical is a portable unit and comes complete with rechargeable NI CAD battery and carrying case. The PYRO Optical radiation pyrometer is used for many industrial applications to measure non contact high temperature measurements. The optical sensor red scales can be provided for emissivity correction of targets with a 0.4 emissivity value. This is useful for temperature measurement of molten iron & steel. The PYRO Optical pyrometer is calibrated at an effective wavelength of 0.655µm and is inherently less subject to most errors due to uncertain emissivity or extraneous reflected light than infrared or radiation thermometers.